A shaving kit can greatly increase the positive emotion and effect related to the process of shaving, and facial hair hygiene. Although a razor is usually the dominant tool in the shaving kit, a number of other items connected to it assist the process and add to the positive side of the experience. These accessories include a shaving brush, shaving cream, pre-shave oil, and after shave. If these are utilized, there is a high chance of avoiding uncomfortable issues such as ingrown hairs, scrubby beards and razor burn. The mentioned negative by-products of shaving can be prevented most of the time when all these elements are involved in the shave. Shaving kits are created in relation to the specific sort of beards and skin types, in regards to the kinds of skin and hair. Examples include kits for normal skin, sensitive skin, oily and dry skin. More simplified forms of shaving kits simply include a shaving razor and shaving foam, and these are usually targeted at customers that do not wish to complicate matters with a more elaborate kit. A full shaving kit should be garnered in case of extreme shaving difficulties, with the simplified forms being the other extreme. While some shaving problems need more complex solutions, certain shaving issues can easily be solved by simply using pre-shave products such as exfoliant scrubs. These are then mixed with hot water and aid in pores' relaxation, thus making the shaving smoother and reducing the chance of pain. 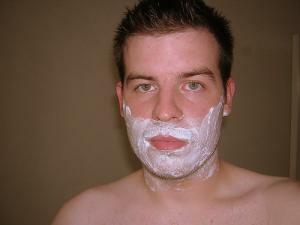 Pre-shave oils are often a significant tool for pore opening as well. Considering mineral oils can sometimes cause pore clogging, natural pre-shave oils are recommended instead, as they do not suffer from this disadvantage. Pre-shave products that contain antibacterial formulations are more effective due to the fact that cuts and skin breakage can be a frequent occurrence when shaving. Electric shavers greatly benefit from blade oil, which not only benefits the skin, but can often prolong the life cycle of the shaver, even when only applied in relatively small amounts. This also decreases the chance of a painful shaving. Two kinds of shaving powder are included in most shaving kits: there is a depilatory kind, used to fight ingrown hairs and razor bumps, and a softener kind that softens the region in need of a shave. What do you call the instrument with which you shave?